A place for the video artists from artreview to share works and ideas, and nurture collaborative works. Critics, curators, collectors and galleries interested in video are also very welcome. Started by Eirini Olympiou. Last reply by Jorge Correo Apr 22, 2017. Started by Bo Lee Feb 25, 2013. Started by Tatjana de Luxe Feb 24, 2013. Started by Transfera Feb 2, 2013. Started by Transfera Apr 24, 2012. Please help the artist, click this video million times, thank you. Started by AVI ROSEN Oct 10, 2011. Started by ARTStap International Aug 29, 2011. Started by Petra Feb 17, 2011. Started by International ArtExpo Feb 8, 2011. Started by stephenmead Jan 29, 2011. Started by International ArtExpo Jan 17, 2011. Started by Transfera Jan 12, 2011. Started by stephenmead. Last reply by Neil Howe Dec 11, 2010. Started by Evelin Stermitz Nov 7, 2010. Started by Evelin Stermitz. Last reply by Lira Kay Oct 26, 2010. Started by levente kozma. Last reply by levente kozma Jul 31, 2010. Started by Evelin Stermitz Jul 13, 2010. You need to be a member of Video Artists to add comments! Trailer INNER PROJECTIONS FROM A BROKEN MAN from Danny Germansen on Vimeo. Trailer ANTI-SOCIAL CLUB from Danny Germansen on Vimeo. http://www.rawfilmfestival.com/ A new short film festival in Los Angeles taking submissions now.. 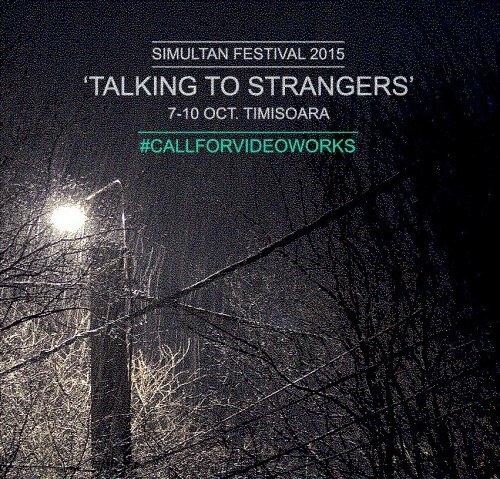 The 11th edition of the Simultan Festival will take place between 7-10 October, under the theme “Talking to Strangers”..
this series to be exhibited in Bundaberg, Australia - september 2014 + other venues.